I didn't buy my first card by itself, as the seller had another one that I never knew I needed until it was right there in front of my face. SON OF COUL. Sadly, it didn't feature any fake blood, so this must have been the business shirt he wore when he was conducting business that didn't involve dying. The next two I had my eye on were auctions, and while I prefer Buy It Nows 99% of the time, I didn't really have a choice. I won the Steve Rogers, and lost the Avengers Loki, so the obvious snap buying decision was to buy a Loki costume card from Thor. 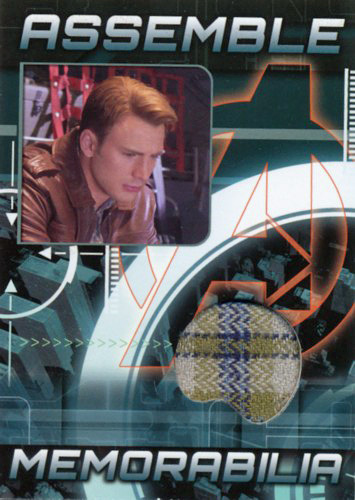 The Steve card was actually originally intended as a gift, but then when it turned up I, er, decided to keep it. That checked shirt is adorable. C'mon. 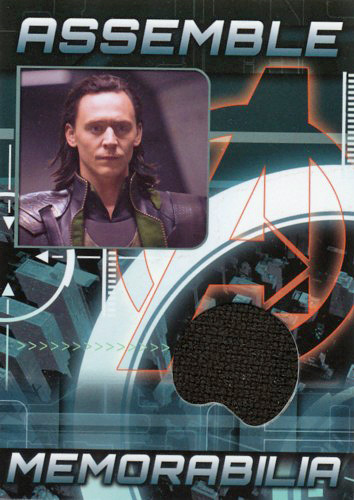 The Loki card was actually the first to physically turn up in my hands, and is probably my favourite out of all of them. The material feels like Pony Hair (which actually comes from cows, go figure), and it's wonderfully tactile. Not that I touched it that much, of course. Wouldn't want the Essence 'O' Hiddleston to wear off. I did love my Thor-version Loki card, but given that all the others were from the Avengers line, I was still kicking myself over missing out on the earlier Loki auction. 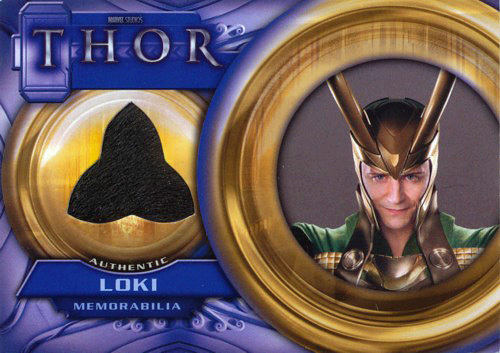 I had bought a Thor card that I was admittedly rather apathetic about, but hey, a piece of his cape would be cool, right? One day, while waiting for it to turn up, I got a notification from eBay to say one of my saved searches had new results. Could it be...? Could it...? WOOP WOOP! Mine! The fabric is much more utilitarian than the Thor Loki card, but it probably touched Tom Hiddleston just as much, so I can live with it. With my White Whale chased and captured, I was happy to call it a day on my my flurry of ridiculous collecting. That was until the Thor card failed to turn up and the seller issued me a refund. Well, if I was going to be refunded the amount of a costume card, I might as well just buy another one! I looked around for a while, because while my previous card choices were admittedly questionable at best, I didn't want to buy something stupid. 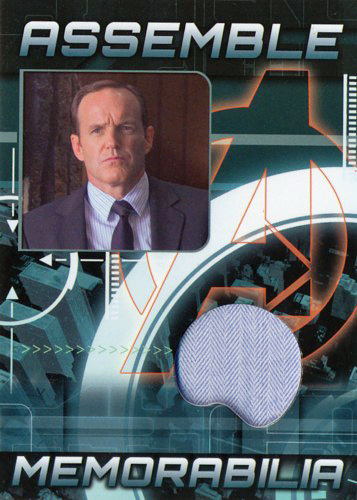 Patience paid off, and I found the most un-stupid costume card ever. 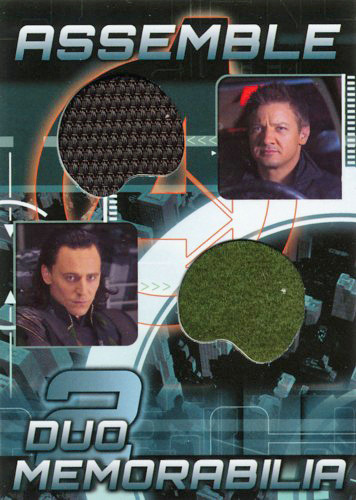 Hawkeye AND Loki? On the SAME CARD? What witchcraft is this?? It might as well have my name written on it. I tried to justify it to myself by saying that it was a different section of Loki's costume, but it was a weak argument. 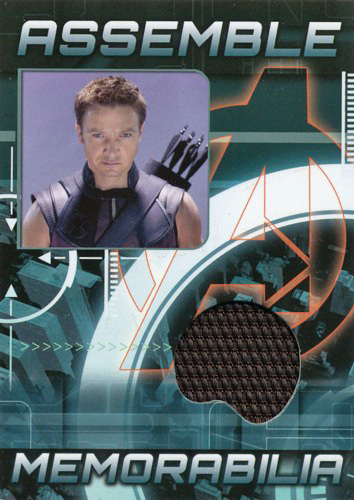 At least Renner looks slightly less awkward in this one. Slightly. Consider this a cautionary tale, friends. It would seem costume cards are like Pringles; you can never stop at just one. Keep thyself away from the Bay of e, lest you find yourself stumbling down the rabbit hole, covered in Pringle crumbs and clutching something that may at some point have come into contact with Chris Hemsworth's ridiculous biceps. WAAAAAAAAAY more creepy than I am, my friend. At least I have focus. there is not enough Like buttons.